“The people made the Constitution, and the people can unmake it. It is the creature of their own will, and lives only by their will.” Those are the words of Chief Justice John Marshall in his 1821 Supreme Court ruling of Cohens v. Virginia. It declared that the Supreme Court could review state supreme court decisions, reinforced the “supremacy clause” of the Constitution, and solidified the idea that the Constitution was a “living,” “elastic” document. Marshall was wrong in 1821, at least in regard to how the ratifiers intended the Constitution to be read, but his opinions have outlasted those of his opponents. The founding father John Marshall might not be a household name to most Americans, but he is, along with Hamilton, one of the most important Federalists in American history. The federal government would not be the same (or as powerful) without him. John Marshall was born on 24 September 1755 on the Virginia frontier. His family lived a modest, comfortable life. 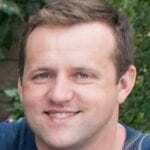 His father, Thomas Marshall, was a second generation American of Welsh descent. His mother, Mary Randolph, came from a more prestigious lineage. She was a descendent of the Randolph and Isham families, both of which had connections to the seventeenth- century English gentry. John Marshall could count a number of important Americans among his extended family, including Thomas Jefferson, Robert E. Lee, and John Randolph of Roanoke. There is some question about his mother’s legitimacy in the Randolph family, but she was reared by the family and was considered a “blood” member. Marshall spent most of his youth on the frontier and had little in the way of formal education. His family was not wealthy enough to possess a library, though he was acquainted with several Roman histories and some English literature. He took an interest in the law at seventeen when his father purchased a copy of William Blackstone’s Commentaries on the Laws of England. His youthful passions for learning and frontier leisure were interrupted by the Revolution. At twenty, Marshall became a member of the Culpeper Minute Men and took part in the siege of Norfolk in 1775. He was commissioned a lieutenant in the 3rd Virginia Regiment of the Continental Army in 1776 and eventually reached the rank of captain. He served with distinction at the battles of Brandywine, Germantown, and Monmouth, and suffered with the rest of Washington’s army at Valley Forge in 1777 and 1778. The war had an interesting effect on Marshall’s political ideology. He wrote that during the war, he “was confirmed in the habit of considering America as my country and Congress as my government.” This was in sharp contrast to most men in the Founding generation, particularly Southerners such as John Taylor or Nathaniel Macon, who considered their state to be their country and the “united States” as simply an expedient confederation. Marshall was fast becoming a nationalist during the war. He returned home when his commission expired in 1779 and was mustered out of service in 1781. He attended a series of law lectures given at the College of William and Mary by noted legal scholar George Wythe in 1780 and was admitted to the bar in Fauquier County the same year. He fell in love with the state treasurer’s daughter during his time in Williamsburg and the two were married in 1783. In the meantime,John Marshall was elected to the Virginia legislature in 1782, moved to Richmond, and opened an office in the city. Work was slow for a man whom Jefferson called lazy and predisposed to leisure, and whom most contemporaries viewed as disheveled. And though he had little money, Marshall reportedly gambled much of his salary away, spent too much on liquor and social events, bought an occasional slave, and speculated in land. The home-spun frugality of his frontier rearing quickly evaporated in the “big city” of Richmond. Regardless of his own financial problems, Marshall viewed Virginia politics as corrupt and was shocked by what he considered latent demagoguery by many Virginia leaders, including Patrick Henry. Democracy worried him. Many of the farmers who supported Henry and controlled the government were bankrupt, and when Shay’s Rebellion took place in Massachusetts in 1786, Marshall theorized that the “common man” was incapable of self-government. Of course, Shay’s Rebellion was a reaction to oppressive taxation, but to Marshall, it was a manifestation of the evils of the leveling spirit of democracy, and it needed to be checked. Constitutional reform offered that possibility. John Marshall heartily supported Madison’s efforts to strengthen the central government in 1787. Both men had established reputations as opponents of Patrick Henry’s firm grip on the Virginia legislature and welcomed a restraint (even at the Federal level) on his substantial power. Marshall served as a member of the state ratification convention in 1788. He supported the Constitution without amendments and spoke on a number of occasions in defense of the wide-ranging authority of the new government, particularly in relation to the new judicial branch. His statements foreshadowed his actions as Chief Justice of the Supreme Court. Marshall laid the foundation of judicial review when he remarked to the convention that the Supreme Court could declare a law “void” if the Congress violated its “enumerated” and “delegated” powers. This statement can be read in two ways. First, Marshall considered judicial review constitutional in 1788, though the Constitution did not specifically outline such a doctrine. He was consistent on this point throughout his life. Second, Marshall implicitly argues for states’ rights when he declares that any congressional law that violated the “enumerated” and “delegated” powers of the Constitution was unconstitutional. John Marshall would oppose this position later in his career. He also believed that a bill of rights was “merely recommendatory” because if it were “otherwise, the consequence would be that many laws which are found convenient would be unconstitutional.” The Anti-Federalists claimed that was the point. Federal power needed to be checked. Marshall believed otherwise and contended the Congress would never act beyond the scope of its “defined” powers. But Marshall came to believe that the “defined” powers of the Federal government were expansive. Marshall voted for the Constitution, and because of his performance at the convention became a leading Federalist in Virginia. Though in sympathy with Washington, Adams, and other Federalists, he declined serving in the new government on several occasions. He refused Washington’s offer of attorney general in 1795 and an appointment as minister to France in 1796. Adams persuaded him to accept the same position in 1797, though Marshall’s acceptance might have been driven by financial need. His one-year salary as minister was three times his legal earnings, and Marshall used this money to save his teetering investments. Once home from France, he turned down an appointment to the Supreme Court, but was elected to Congress in 1799 as a Federalist. He was one of the few supportive voices of the Adams administration in Congress, and within a year, Adams tapped him to be Secretary of State. He did little during his time in the executive branch, and his general laziness in the office led to a bitter court battle years later (as we’ll see in Marbury v. Madison). When Supreme Court Chief Justice Oliver Ellsworth resigned from the bench in 1801, Adams nominated Marshall for the position. This was the most important decision of his administration. Marshall accepted, and for the next thirty-five years dominated the judicial branch of the United States and defined the powers and procedures of the court in Federalist terms. The Republican-controlled Congress refused to allow the court to meet for over a year. When the court reconvened in 1803, Marshall wanted to ensure that the “prestige” of the Court would be upheld. The first case on the docket appeared under the title Marbury v. Madison. This case actually involved Marshall, so he should have been disqualified from presiding over it, but he didn’t remove himself and ultimately issued, as the “unanimous court,” one of the most important decisions in court history. William Marbury was an Adams federal appointee to a minor position in the District of Columbia under the dubious Judiciary Act of 1801, a bill that enlarged the federal court system and allowed Adams to place several Federalist judges in the federal circuit. When Jefferson and the Republicans took power in 1801, they repealed the act. Marbury’s commission was signed by Marshall, but he failed to deliver it to him, making it unofficial. Jefferson refused to allow Marbury to take his position, claiming that a sealed appointment from a previous administration did not constitute a legal, binding deed. If the appointment was not delivered, it did not exist. This was Marshall’s personal revenge on the Virginia and Kentucky Resolutions. Jefferson and Madison pointed out in 1798 through the Virginia and Kentucky legislatures that states could interpose state sovereignty against the enforcement of laws by which the federal government exceeded its delegated authority. Marshall disagreed. Judicial review became the standard interpretation of court power following Marbury v. Madison, much to the dismay of Thomas Jefferson who later in life lamented, “Yet this case of Marbury and Madison is continually cited by bench and bar, as if it were settled law, without any animadversion on its being merely an obiter dissertation of the Chief Justice.” In other words, Jefferson thought Marshall used the court as a pulpit for his personal political and legal theories and as a means to attack his enemies. Republicans had the chance to stop Marshall in 1804. The House of Representatives impeached Supreme Court Justice Samuel Chase for partisan attacks from the bench. This was a “high crime and misdemeanor” under the traditional definition, and the Republicans hoped that by making an example of Chase they could overturn “judicial review” and any other doubtful Federalist court decisions and mute activist judges. Marshall was genuinely scared. He testified on behalf of Chase, timidly. When the Senate failed to convict Chase, Marshall went on the warpath. The scope of his decisions over the next thirty years covered all aspects of federal power. Jefferson thought his aim was to reduce state authority and take revenge on the Republicans. He certainly had cause to believe this.John Marshall once called the Republicans “speculative theorists and absolute terrorists.” He ruled in 1807 that Aaron Burr was not guilty of treason, a personal affront to Jefferson who wanted Burr hanged for his suspicious activity on the frontier (where it was alleged that, among other things, Burr was conspiring to detach western territories from the United States). In the 1810 Fletcher v. Peck decision, Marshall declared a state law unconstitutional and determined that states could not repudiate their contracts. This strengthened federal authority and made state laws subject to federal judicial oversight, something many of the ratifiers feared. Marshall himself attempted to alleviate those fears during the Virginia Ratifying Convention in 1788. “Can they make laws affecting the mode of transferring property, or contracts, or claims, between citizens of the same state?” he asked of the federal power in 1788. He said no then, but reversed course in 1810. 1819 was a busy year for Marshall and a depressing and shocking year for strict constructionists. Marshall ruled in the case of Sturges v. Crowninshield that federal jurisdiction over contracts applied to both states and private individuals. In other words, the Supreme Court could determine if state laws in respect to private as well as public contracts were constitutional. Marshall followed a similar course in the Dartmouth College Case. The Court ruled that states could not void a contract, in this case the charter of Dartmouth College. This again was an affront to state power, but his most important decision of 1819 was the McCulloch v. Maryland case, a decision that appeared to vindicate the “loose interpretation” of the Constitution outlined by Alexander Hamilton in 1791. The chief issue was the constitutionality of the national bank.John Marshall declared the bank constitutional under the “implied” powers of the Constitution. “Let the end be legitimate, let it be within the scope of the constitution, and all means which are appropriate, which are plainly adapted to that end, which are not prohibited, but consist with the letter and spirit of the constitution, are constitutional.” So, essentially, the ends justify the means (expanding the federal government). How convenient. Under this definition, anything can be constitutional as long as it is consistent “with the letter and spirit of the constitution” as interpreted by the federal government itself. John Marshall did not stop there. He unilaterally defined the “supremacy clause,” and the “necessary and proper clause” of the Constitution. First, as to the “supremacy clause,” “If any one proposition could command the universal assent of mankind, we might expect it would be this—that the government of the Union, though limited in its power, is supreme within its sphere of action.” But the “necessary and proper clause,” wrote Marshall, “purport[s] to enlarge, not to diminish the powers vested in the government. It purports to be an additional power, not a restriction on those already granted.” So, the government has limited powers, but those limited powers are infinite and implied. In 1788 Marshall had said that the federal government had “enumerated” and “delegated” powers. He skirted around this apparent contradiction by stating that under a “strict interpretation” of the Constitution, even many of the enumerated powers could not be applied, so that only a “loose interpretation” of the Constitution allowed Congress to do its “job” of passing expansive legislation. His final blows at states’ rights were in the aforementioned Cohens v. Virginia and the 1824 decision of Gibbons v. Ogden. The Cohens decision was a follow- up to the McCulloch case and the Gibbons decision expanded federal power by declaring that the federal government, through the power to regulate commerce, had the power to “prescribe the rule by which commerce is to be governed. This power, like all others vested in Congress, is complete in itself, may be exercised to its utmost extent, and acknowledges no limitations, other than are prescribed in the constitution.” Under this definition, anything that might be considered “commerce” falls under federal jurisdiction and regulation. 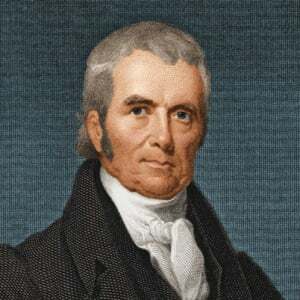 John Marshall distrusted the people’s capacity to govern and believed that liberty was best secured by an aggressive central authority and not by local or state governments. John Randolph of Roanoke, a friend and bitter rival, agreed with Marshall on the dangers of democracy, or “King Numbers” as he called it. Marshall truly believed the Constitution was, as Madison argued in Federalist No. 10, the only safeguard against the “demagoguery” of Patrick Henry and other state factions. But, he unknowingly set the stage for the rapid growth of the central government in the twentieth century. His goal was a conservative one—to set up a safeguard against demagoguery—but in the end he only established the precedents for an over-mighty central government that was as subject to demagogues as any state or local faction. Marshall died in 1835 at the age of eighty, fulfilling his lifetime appointment to the bench. His decision to stay until his death was a political one; he did not want Andrew Jackson to have the satisfaction of appointing his replacement. He died during Jackson’s second term. One can argue that all of his important decisions were personally or politically motivated in some way. He felt sorry for neglecting Marbury’s appointment in 1803 and indirectly ruled in his favor while giving Jefferson a lecture; he acquitted Burr in 1807 in order to humiliate Jefferson; he ruled against Georgia in 1810 because he had a vested financial stake in a similar case involving a Virginia state contract and didn’t want to lose money; he believed in Hamiltonianism and thus ruled that “implied” powers were constitutional. He once said that “the acme of judicial distinction means the ability to look a lawyer straight in the eyes for two hours and not hear a damned word he says.”John Marshall had typically decided his course before arguments were made. He preferred the closing to the opening, and rarely heard what opponents had to say. His constitutional theories were “vindicated” by his protégé, Joseph Story, in an 1833 treatise on the Constitution that is still in print. For good or ill, Marshal is one of the most influential members of the founding generation.